The surface area of the seat as well as the size of the backrest have also both been increased due to popular request. Furthermore, the 4D armrests are significantly larger so as to not only make the HERO look more impressive as a whole, but to also make it significantly more comfortable. The improved comfort provided is also due in no small part to the padding. Standing in stark contrast to competing gaming chairs, the noblechairs HERO offers a solid steel frame ensconced within its upholstery. The entire seat is coated in 1,7 mm thick real leather covering, something that also contributes to the chair's outstanding durability. The Safety Class 4 gas lift is rated, in combination with the optimised base, for maximum loads of up to 180kg. Maximise Your Comfort While Optimising Your Posture! The comfort offered by noblechairs is well established, but investing in ergonomic accessories is not just a sensible idea, it's a way of taking preemptive action against the negative side-effects associated with poor posture over the long term. In bringing the noblechairs footrest to market, the noblechairs team has developed just such an accessory. More links for "HERO Real Leather Gaming Chair - Black"
I replaced my old real leather office chair and wanted something more stunning, and noblechairs create such brilliant chairs that are gaming chairs but don't look tacky! It looks absolutely incredible in my office. I don't game much anymore, but I still like to have the very best when it comes to PC hardware and peripherals! After having an Marcus office chair for a few years I wanted to treat myself to something new, and something with premium leather and I cannot believe how good this chair is, it blows everything I've ever tried out of the water! Not only does this chair offer a great user experience, both in thanks due to the sturdiness and comfort it has to offer, but it also has the added lumbar support in the chair itself for extra comfort and support during prolonged sitting sessions. 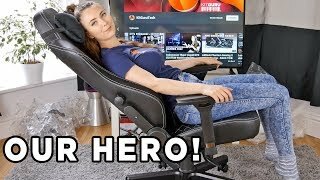 If you’re looking for the best of the best, you’re going to have to pay a bit extra for it and that is exactly what we see here with the HERO Gaming Cahir from noblechairs. You’ll struggle to find a better-made gaming chair at this price. 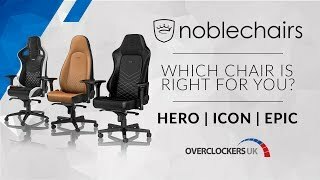 noblechairs have been dominating the market for quality for a few years now, and I’m happy to report that trend continues with the Hero. noblechairs gaming chairs promote good ergonomics and are of top-notch quality. "Not all heroes wear capes" certainly applies here, we loved the HERO and the improvements it brought along with it, though by all means, you can attach a cape, just watch it doesn't get stuck in the wheels! Overall I'm pretty happy to recommend them as a long-term user. noblechairs hits the nail on the head with the HERO Real Leather gaming chair, with slick styling and upgrades over its previous chairs. It's super luxurious and comfortable to sit on, aimed squarely at not just eSports gamers, but any gamer who spends considerable time at their PC. The noblechairs HERO is a superb gaming chair in every sense of the word from build quality, to the comfort to all the final touches. The HERO is certainly the chair for the larger gamer or user, without sacrificing on quality or paying over the odds. It's receiving our Editor's Choice award as quite frankly I will use this every day and know that i'm supported ergonomically just like I deserve to be!